ASP.NET Zero User Interface is completely localized. ASP.NET Zero uses dynamic, database based, per-tenant localization (See the related section above). 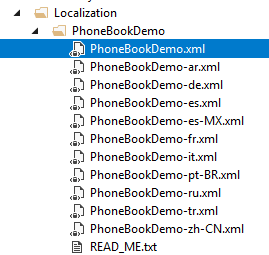 PhoneBook will be your ProjectName. You can add more XML files by copying one XML file and translate to desired language. See valid culture codes. When you are adding a new localizable text, add it to the XML file of the default language then use in your application (Also, add translated values to corresponding XML files). No need to add it to database migration code since value in the XML file will be used as default. Application languages are defined in DefaultLanguagesCreator class. This is used as a seed data in Entity Framework Migration. So, if you want to add a new default language, just add it into DefaultLanguagesCreator class. Also, you should add a corresponding XML file as described above as default translation. See localization and language management documentations for more information.